Initially created as a quick runway black-top asphalt and bomb damaged runway repair for the military. Since that time, new developments of cost effective alternatives to traditional spall repair, driveway asphalt repair, floor repair and othe asphalt restoration proceedures. The GeoCHEM distinction with GeoFlo Rapid Asphalt Repair is that it uses a sand that is polymer coated at the plant. A naturally rounded sand is utilized and the is polymer coated in the plant. This type of polymer coated aggregate greatly enhances flow ability (GeoFlo) and increases the overall strength of the crack repair. 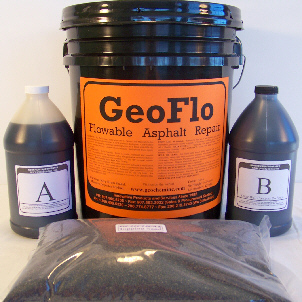 GeoFlo Rapid Asphalt Repair is provided in five gallon bucket kits with pre-measured polymers and sand. Every 5-gallon bucket unit will yield 0.5 cubic feet which will cover around 50 square feet at a thickness of 1/8″. For deeper repairs, include 25 lbs. of our BlackRock and blend with the Mix. This will bring your coverage up to 0.6 cubic feet. GeoFlo Crack Repair materials can be blended in the 5 Gallon pail it comes in with a hand drill and paddle mixer or with the Motor Mix Machine. GeoFlo Rapid Asphalt Repair has a 6-8 minute working time at 75ºF. Asphalt Black-top Repairs can be finished utilizing GeoFlo Asphalt Repair in a matter of minutes with a couple basic steps. There is no requirement for saw cutting or utilizing a primer. The area of repair can be returned to traffic in as little as 30 minutes. Simple Application: No special tools or equipment are needed and repairs can be completed in 5 minutes. Durable Long Lasting Repairs: Strong repairs can be done without dig-outs, restoring aggregate interlock and pavement strength with a 5+ year life expectancy. Some of the advantages that GeoFlo Rapid Asphalt Repair offers vs. conventional materials are: Fast setup and repair, Seals & waterproofs: GeoFlo resists damage from water and vehicle fluids. Increased safety with minimal traffic delays: requires closure of the affected lane only and shortens road closure times. Repairs can be completed at any time, day or night. GeoFlo is odor and fume-free. Unaffected by temperatures: GeoFlo will not soften or track in hot weather and is not susceptible to frost thaw cycles. Repairs are precisely to grade: providing a smooth, self compacting high-traction surface. GeoFlo is cold applied and is a liquid and aggregate combined slurry that hardens in minutes not hours to provide a long lasting repair of your black top asphalt without the need to remove damaged asphalt or dig outs of any kind. GeoFlo utilizes a patented coated aggregate which contributes to the flowability (GeoFlo) and ease of installation. GeoFlo can be finished precisely to grade, resulting in a smoother ride over the repaired areas. GeoFlo is easily feathered into the surrounding asphalt to form a repair that blends in visually with the existing pavement. GeoFlo restores aggregate interlock and pavement strength by promoting adhesion between the repaired area and the existing asphalt. GeoFlo can be used anytime the need arises. No need to wait for hot asphalt or heavy equipment. In temperatures below 58°, add 1-ounce bottle of catalyst to your order. This will cause GeoFlo to set up faster in cold weather.